Chechens (/ˈtʃɛtʃən/; Chechen: Нохчий Noxçiy; Old Chechen: Нахчой Naxçoy) are a Northeast Caucasian ethnic group of the Nakh peoples originating in the North Caucasus region of Eastern Europe. They refer to themselves as Vainakhs (which means our people in Chechen) or Nokhchiy (pronounced [no̞xtʃʼiː]; singular Nokhchi, Nakhchuo or Nakhtche). Chechen and Ingush peoples are collectively known as the Vainakh. The majority of Chechens today live in the Chechen Republic, a subdivision of the Russian Federation. The term "Chechen" first occurs in Arabic sources from the 8th century. According to popular tradition, the Russian term "Chechen" comes from the name of the village of Chechen-Aul. The word "Chechen", however, occurs in Russian sources as early as 1692 and the Russians probably derived it from the Kabardian "Shashan". The Chechens are mainly inhabitants of Chechnya. There are also significant Chechen populations in other subdivisions of Russia (especially in Dagestan, Ingushetia and Moscow). Outside Russia, countries with significant diaspora populations are Kazakhstan, Turkey, Azerbaijan, and Arab states (especially Jordan and Iraq, where they are mainly descendants of people who had to leave Chechnya during the Caucasian War, which led to the annexation of Chechnya by the Russian Empire around 1850) and the 1944 Stalinist deportation in the case of Kazakhstan. Tens of thousands of Chechen refugees settled in the European Union and elsewhere as the result of the recent Chechen Wars, especially in the wave of emigration to the West after 2002. The Chechens are one of the Nakh peoples, who have lived in the highlands of the North Caucasus region since prehistory. There is archeological evidence of historical continuity dating back since 3000 B.C. as well as evidence proving their migration from the Fertile Crescent c. 10,000–8,000 B.C. In the Middle Ages, the lowland of Chechnya was dominated by the Khazars and then the Alans. Local culture was also subject to Georgian influence and some Chechens converted to Eastern Orthodox Christianity. Gradually, Islam prevailed, although the Chechens' own pagan religion was still strong until the 19th century. Society was organised along feudal lines. Chechnya was devastated by the Mongol invasions of the 13th century and those of Tamerlane in the 14th. The Vainakh bear the distinction of being one of the few peoples to successfully resist the Mongols and defend themselves against their invasions; not once, but twice, though this came at great cost to them, as their state was utterly destroyed. These events were key in the shaping of the Chechen nationhood and their martial-oriented and clan-based society. In the late Middle Ages, the Little Ice Age forced the Chechens down from the hills into the lowlands, where they came into conflict with the Terek and Greben Cossacks who had also begun to move into the region. The Caucasus was also a major competing area for two neighbouring rival empires: the Ottoman and Persian Empires (Safavids, Afsharids, Qajars). Starting from 1555 and decisely from 1639 through the first half of the 19th century, the Caucasus was divided by these two powers, with the Ottomans prevailing in Western Georgia, while Persia kept the bulk of the Caucasus, namely Eastern Georgia, Dagestan, Azerbaijan, and Armenia. The Chechens, however, never really fell under the rule of either empire. As Russia expanded slowly southwards as early as the 16th century, clashes between Chechens and the Russians became more frequent, and it became three empires competing for the region. As Russia set off to increase its political influence in the Caucasus and the Caspian Sea at the expense of Safavid Persia, Peter I launched the Russo-Persian War (1722-1723), in which Russia succeeded in taking much of the Caucasian territories for several years. Notable in Chechen history, this particular Russo-Persian War marked the first military encounter between Imperial Russia and the Vainakh. Sheikh Mansur led a major Chechen resistance movement in the late 18th century. In the late 18th and 19th centuries, Russia embarked on full-scale conquest of the North Caucasus in the Caucasian War. Much of the campaign was led by General Yermolov who particularly disliked the Chechens, describing them as "a bold and dangerous people". Angered by Chechen raids, Yermolov resorted to a brutal policy of "scorched earth" and deportations; he also founded the fort of Grozny (now the capital of Chechnya) in 1818. Chechen resistance to Russian rule reached its peak under the leadership of the Dagestani leader Imam Shamil. The Chechens were finally defeated in 1861 after a bloody war that lasted for decades, during which they lost most of their entire population. In the aftermath, large numbers of refugees also emigrated or were forcibly deported to the Ottoman Empire. Since then, there have been various Chechen rebellions against Russian/Soviet power (including during the Russian Civil War and World War II), as well as nonviolent resistance to Russification and the Soviet Union's collectivization and anti-religion campaigns. In 1944, all Chechens, together with several other peoples of the Caucasus, were ordered by the Soviet leader Joseph Stalin to be ruthlessly deported en masse to the Kazakh and Kirghiz SSRs; and their republic and nation were abolished. At least one-quarter—and perhaps half—of the entire Chechen population perished in the process, and a severe blow was made to their culture and historical records. Though "rehabilitated" in 1956 and allowed to return the next year, the survivors lost economic resources and civil rights and, under both Soviet and post-Soviet governments, they have been the objects of both official and unofficial discrimination and discriminatory public discourse. Chechen attempts to regain independence in the 1990s after the fall of the Soviet Union have led to the first and the second war with the new Russian state, starting in 1994. The main language of the Chechen people is Chechen. Chechen belongs to the family of Nakh languages (Northeast Caucasian languages). Literary Chechen is based on the central lowland dialect. Other related languages include Ingush, which has speakers in the neighbouring Ingushetia, and Batsbi, which is the language of the people in the adjoining part of Georgia. At various times in their history, Chechens used Georgian, Arabic and Latin alphabets; as of 2008, the official one is now the Cyrillic script of Russia. Most Chechens living in their homeland can understand Ingush with ease. The two languages are not truly mutually intelligible, but it is easy for Chechens to learn how to understand the Ingush language and vice-versa over time after hearing it for a while. In 1989, 73.4% spoke Russian, though this figure has declined due to the wars for a large number of reasons (including the lack of proper education, the refusal to learn the language, and the mass dispersal of the Chechen diaspora due to the war). Chechens in the diaspora often speak the language of the country they live in (English, German, Arabic, Polish, Georgian, etc.). Chechens are a Nakh people, and discussion of their origins is intertwined with the discussion of the mysterious origins of Nakh peoples as a whole. The only two surviving (and fairly numerous) Nakh peoples are Chechens and Ingush, but they are thought by some scholars to be the remnants of what was once a larger family of peoples. The Nakh languages are a subgroup of Northeast Caucasian, and as such are related to Nakho-Dagestanian family, including the languages of the Avars, Dargins, Lezghins, Laks, etc. However, this relationship is not a close one: the Nakho-Dagestani family is of comparable or greater time-depth than Indo-European, meaning Chechens are only as linguistically related to Avars or Dargins as the French are to the Russians or Iranians. Nakh peoples such as Chechens are thought to either be descended from original settlers of the Caucasus (North and/or South) or supposedly Nakh-speaking ethnic minorities in the north-eastern regions of the ancient state of Urartu (whose people also spoke a language that was possibly related to the Nakh languages). The two theories are not mutually incompatible, and there has been much evidence that seems to link both of the two together (either by dual origins or the "return" theory, in which the Nakh peoples originally lived in the Caucasus and then returned). Chechen genetics show a high level of genetic diversity (see section below). In particular, the Chechens are descended from the Durdzuks, a group well known in the Georgian chronicles (Dourts in the Armenian version). Other groups linked Amjad Jaimoukha traces the name Durdzuk to an ancient city north of Lake Urmia, near Nakhichevan (Nakhichevan is thought to be a Nakh placename by some). Other groups attributed to being the ancestors of the Chechens and Ingush include the Kists (in the Georgian chronicles), Gargareans (from the Nakh root gergara; reported by Strabo to have "returned" from the South Caucasus to the North Caucasus, fleeing the wars in the south) and the Nakhchmateans (Armenian chronicles). Genetic tests on Chechens, have shown roots mostly in the Caucasus as well as slight connections to and influences from the Middle East as well as Europe. The most recent study on Chechens, by Balanovsky et al. in 2011 sampled a total of 330 Chechens from three sample locations (one in Malgobek, one in Achkhoy-Martan, and one from two sites in Dagestan) and found the following frequencies: A weak majority of Chechens belong to Haplogroup J2 (56.7%), which is associated with Mediterranean, South Caucasian and Fertile Crescent populations, with its peaks at 87.4% in Ingushetia and 72% in Georgia's Kazbegi Municipality. In the North Caucasus, the largest frequencies are those of Nakh peoples (Chechens (56.7%) and Ingush (88.8%)). Other notable values were found among North Caucasian Turkic peoples (Kumyks (25%) and Balkars (24%)). It is notable that J2 suddenly collapses as one enters the territory of non-Nakh Northeast Caucasian peoples, dropping to very low values among Dagestani peoples. The overwhelming bulk of Chechen J2 is of the subclade J2a4b* (J2-M67), of which the highest frequencies by far are found among Nakh peoples: Chechens were 55.2% according to the Balanovsky study, while Ingush were 87.4%. Other notable haplogroups that appeared consistently appeared at high frequencies included J1 (20.9%), L (7.0%), G2 (5.5%), R1a (3.9%), Q-M242 (3%) and R1b-M269 (1.8%, but much higher in Chechnya itself as opposed to Dagestani or Ingushetian Chechens). Overall, tests have shown consistently that Chechens are most closely related to Ingush, Circassians and Georgians, occasionally showing a kinship to other peoples in some tests. Balanovsky's study showed the Ingush to be the Chechens' closest relatives by far. Chechens are mostly brown, red or fair-haired (with darker hair predominating) and eyes can be brown, blue or green, while skin is usually light. George Anchabadze notes that the physical traits of Chechens, which includes being taller than average, are typical of the "Caucasian type" which many other peoples of the Caucasus exhibit. 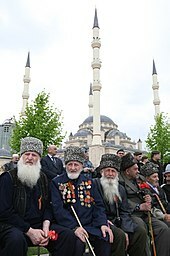 Chechen World War II veterans during celebrations on the 66th anniversary of Victory in the Great Patriotic War. Prior to the adoption of Islam, the Chechens practiced a unique blend of religious traditions and beliefs. They partook in numerous rites and rituals, many of them pertaining to farming; these included rain rites, a celebration that occurred on the first day of plowing, as well as the Day of the Thunderer Sela and the Day of the Goddess Tusholi. In addition to sparse written record from the Middle Ages, Chechens traditionally remember history through the illesh, a collection of epic poems and stories. Chechen society is structured around tukhum (unions of clans) and about 130 teip, or clans. The teips are based more on land and one-side lineage than on blood (as exogamy is prevalent and encouraged), and are bonded together to form the Chechen nation. Teips are further subdivided into gar (branches), and gars into nekye (patronymic families). The Chechen social code is called nokhchallah (where Nokhchuo stands for "Chechen") and may be loosely translated as "Chechen character". The Chechen code of honor implies moral and ethical behaviour, generosity and the will to safeguard the honor of women. The traditional Chechen saying goes that the members of Chechen society, like its teips, are (ideally) "free and equal like wolves". Chechens today have a strong sense of nation, which is enforced by the old clan network and nokhchalla – the obligation to clan, tukhum, etc. This is often combined with old values transmuted into a modern sense. They are mythically descended from the epic hero, Turpalo-Nokhchuo ("Chechen Hero"). There is a strong theme of representing the nation with its national animal, the wolf. Due to their strong dependence on the land, its farms and its forests (and indeed, the national equation with the wolf), Chechens have a strong sense of affection for nature. According to Chechen philosopher Apty Bisultanov, ruining an ant-hill or hunting Caucasian goats during their mating season was considered extremely sinful. It is notable that the glasnost era Chechen independence movement, Bart (unity) in fact originated as a simple environmentalist organization in the republic's capital of Grozny. Chechen culture puts a strong value on the concept of freedom. This asserts itself in a number of ways. A large majority of the nation's national heroes fought for independence (or otherwise, like the legendary Zelimkhan, robbed from the nation deemed the oppressor in order to feed Chechen children in a Robin Hood-like fashion). A common greeting in the Chechen language, marsha oylla, is literally translated as "enter in freedom". The word for freedom also encompasses notions of peace and prosperity. Chechens are sometimes referred to as the "French of the Caucasus", for a number of reasons (it is notable that the Circassians are the "English of the Caucasus", and the Georgians are the "Italians of the Caucasus"). This comparison may refer to either political/historical traits, or to personality characteristics. Like the French, who overthrew their age-old monarchy in the French Revolution, the Chechens had a similar revolution a century or two earlier, and like the French, they bore the distinction (for a period) of being the only egalitarian society in an area full of monarchic states. Like the French, the Chechens preferred swift, revolutionary (and often violent) methods to realize the change they wished to see – unlike the Circassians (called the "English of the Caucasus" both for their political and personality characteristics) who preferred more gradualist methods. Chechens were also called "French" by early Russian military officers and the French anthropologist Ernest Chantre who noted their "happy and witty" nature. Chechnya is predominantly Muslim. Chechens are overwhelmingly adherents to the Shafi'i Madhhab of Sunni Islam, the republic having converted to Islam between the 16th and the 19th centuries. Most of the population follows either the Shafi'i or the Hanafi, schools of jurisprudence, fiqh. The Shafi'i school of jurisprudence has a long tradition among the Chechens, and thus it remains the most practiced. Some adhere to the mystical Sufi tradition of muridism, while about half of Chechens belong to Sufi brotherhoods, or tariqah. The two Sufi tariqas that spread in the North Caucasus were the Naqshbandiya and the Qadiriya (the Naqshbandiya is particularly strong in Dagestan and eastern Chechnya, whereas the Qadiriya has most of its adherents in the rest of Chechnya and Ingushetia). There are also small Christian and atheist minorities, although their numbers are unknown in Chechnya; in Kazakhstan, they are roughly 3% and 2% of the Chechen population respectively. A stereotype of an average Chechen being a fundamentalist Muslim is incorrect and misleading. By the late 2000s, however, two new trends have emerged in Chechnya. 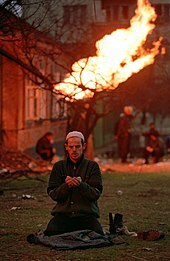 A radicalized remnant of the armed Chechen separatist movement has become dominated by Salafis (popularly known in Russia as Wahhabis and present in Chechnya in small numbers since the 1990s), mostly abandoning nationalism in favor of Pan-Islamism and merging with several other regional Islamic insurgencies to form the Caucasus Emirate. At the same time, Chechnya under Moscow-backed authoritarian rule of Ramzan Kadyrov has undergone its own controversial counter-campaign of Islamization of the republic, with the local government actively promoting and enforcing their own version of a so-called "traditional Islam", including introducing elements of Sharia that replaced Russian official laws. ^ "Chechnya 'has no troops in Ukraine'". Bbc.com. 28 May 2014. Retrieved 17 October 2018 – via www.bbc.com. ^ Ahmet Katav; Bilgay Duman (November 2012). "Iraqi Circassians (Chechens, Dagestanis, Adyghes)" (PDF). ORSAM Reports (134). Archived from the original (PDF) on 3 April 2013. Retrieved 15 April 2013. ^ "Jordan willing to assist Chechnya – King". Reliefweb.int. 2007-08-28. Retrieved 2013-04-20. ^ "Chechen in Azerbaijan". Joshuaproject.net. Retrieved 17 October 2018. ^ "Circassian, Ossetian, Chechen Minorities Solicit Russian Help To Leave Syria". Rferl.org. Retrieved 2013-04-20. ^ "Chechen population in Kyrgyzstan". Kyrgyzstan. ^ "Chechen population in Uzbekistan". Uzbekistan. ^ "Chechen population in Turkmenistan". Turkmenistan. ^ Andrew Meier (April 19, 2013). "The Chechens in America: Why They're Here and Who They Are". The Daily Beast. Retrieved April 30, 2013. Chisholm, Hugh, ed. (1911). "Chechenzes" . Encyclopædia Britannica. 6 (11th ed.). Cambridge University Press. p. 21. ^ "ETHNICITY AND CONFLICT IN THE CAUCASUS(5)". Src-h.slav.hokudai.ac.jp. Retrieved 17 October 2018. ^ a b Wuethrich, Bernice (19 May 2000). "Peering Into the Past, With Words". Science. 288 (5469): 1158. doi:10.1126/science.288.5469.1158. Retrieved 17 October 2018 – via science.sciencemag.org. ^ Minahan, James (2000). One Europe, Many Nations: A Historical Dictionary of European National Groups. Greenwood Publishing Group. p. 168. ISBN 978-0-313-30984-7. ^ Peimani, Hooman (17 October 2018). Conflict and Security in Central Asia and the Caucasus. ABC-CLIO. ISBN 9781598840544. Retrieved 17 October 2018 – via Google Books. ^ Schaefer, Robert W. (2010). The Insurgency in Chechnya and the North Caucasus: From Gazavat to Jihad. ISBN 9780313386343. Retrieved 25 December 2014. ^ a b c "Who are the Chechens?" (PDF). Archived from the original (PDF) on 2006-09-15. by Johanna Nichols, University of California, Berkeley. ^ Johanna Nichols (February 1997). "The Ingush (with notes on the Chechen): Background information". University of California, Berkeley. Archived from the original on March 11, 2008. Retrieved 2007-02-10. ^ Jaimoukha. Chechens. Page 29. ^ a b I. Nasidze, E. Y. S. Ling, D. Quinque et al., "Mitochondrial DNA and Y-Chromosome Variation in the Caucasus Archived 2011-06-08 at the Wayback Machine," Annals of Human Genetics (2004) 68,205–221. ^ Battaglia, Vincenza; Fornarino, Simona; Al-Zahery, Nadia; Olivieri, Anna; Pala, Maria; Myres, Natalie M; King, Roy J; Rootsi, Siiri; Marjanovic, Damir (24 December 2008). "Y-chromosomal evidence of the cultural diffusion of agriculture in southeast Europe" (PDF). European Journal of Human Genetics. 17 (6): 820–830. doi:10.1038/ejhg.2008.249. PMC 2947100. PMID 19107149. ^ a b Caciagli et al, 2009. The key role of patrilineal inheritance in the genetic variation of Dagestani highlanders. ^ Anchabadze, George (2001). The Vainakhs (PDF). Tbilisi: Caucasian House. p. 8. Archived from the original (PDF) on 2012-02-25. ^ Чеченцы // Энциклопедический словарь Брокгауза и Ефрона: В 86 томах (82 т. и 4 доп.). – СПб., 1890–1907. ^ "Chechen Republic – History – Born to be free". Chechen.8m.com. Archived from the original on 2013-05-18. Retrieved 2013-04-20. ^ "The George Washington University - Washington, D.C." (PDF). Gwu.edu. Retrieved 17 October 2018. ^ McDermott, Roger. "Shafi'i and Hanafi schools of jurisprudence in Cechnya". Jamestown.org. Retrieved 2013-04-19. ^ Balzer, Marjorie Mandelstam (2009-11-09). Religion and Politics in Russia: A Reader. ISBN 9780765629319. ^ Wood, Tony. Chechnya: the Case for Independence. pp. 127–145. ^ United Nations High Commissioner for Refugees. "Kadyrov Exploits Ties with Moscow to Build Islamic State". Refworld.org (UNHCR). Retrieved 2013-04-22. ^ "Virtue Campaign on Women in Chechnya under Ramzan Kadyrov | Human Rights Watch". Hrw.org. 2012-10-29. Retrieved 2013-04-22. ^ "Chechen Leader's Islamic Policies Stir Unease". Npr.org. Retrieved 2013-04-22.